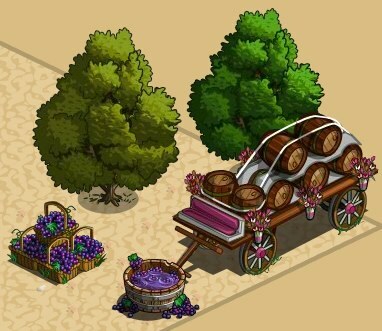 With tonight's FarmVille update comes a fairly large set of items in the current Vineyard limited edition item theme. There are new trees, animals, buildings and decorations available for purchase, and while most do scream "vineyard" when you look at their design, there are still a few items here that would match other themes as well. Without further ado, let's jump right into our look at what's available. Here's something that's both exciting and confusing, as both of these trees are only 5 Farm Cash each. They are a pair, meaning that one will give you the other via Mystery Seedlings, but which tree is the Mystery Seedling tree? Fear not, farmers, as we've figured that out for you. If you're looking to just purchase the level one tree, then purchase the California Laurel, as Bay Laurels will appear from Mystery Seedlings (for free) after the fact. For duck collectors, the White-winged Scoter is a mostly black duck, with white feathers on its wings. Meanwhile, the Camarillo Horse is all white, and actually looks quite dainty when standing next to other, larger horses (mind you, it's still cute). The Camarillo Horse can be bred, producing an adorable Camarillo Foal, so keep that in mind as well. Personally, the Vineyard is one of the prettiest buildings I've seen in quite some time, with tons of landscaping and an animated water wheel. It's just unfortunate that both of these buildings cost Farm Cash, as I would've loved a cheaper option to add them to my farm. For the Grape Vine items, the difference between the two is that the premium item has grapes visibly growing on the vines, while the coin version does not. Meanwhile, Green Hill I is a much larger, and more complex item than the Green Hill II, which also explains the pricing. While there may not be many truly impressive items in this release that are available for coins, you'll still have two weeks to decide whether or not you'd like to splurge by spending some Farm Cash instead. It's likely that Zynga will release more Vineyard items into the theme before these expire, however, so keep checking back with us as we'll be sure you're the first to know if/when they do. Which of these Vineyard items is your favorite? Will you add the Camarillo Horse to your collection? Will you create a whole field with the Grape Vines instead? Sound off in the comments.